Louis Boston, a fixture on Newbury Street that helped usher luxury retail into the city, will move out of its historic building when its lease expires in 2010, opening up the marquee 40,000 square foot space for the first time in 20 years. Owner Debi Greenberg, who took over the business in 2003 from her father, Murray Pearlstein, said the trendsetting boutique will leave Newbury Street, Boston's best-known shopping address, for the waterfront or another neighborhood. Greenberg, who wants to add a spa and bakery to the designer emporium, said she is looking for a new site with the kind of edge Newbury Street used to have. "I want a home that is my own identity. Here on Newbury Street, the stores are all similar. There isn't anything new anymore," Greenberg said. "The building next door houses H&M and Victoria's Secret. It makes this area feel less special and less unique." Louis' move will mark the departure of one of the signature retailers from a street that has migrated away from its eclectic, locally-owned boutique roots to a mall-like scene dominated by chain stores. Louis' current three-story space at Newbury and Berkeley streets features a restaurant, salon, music bar, optical shop, and men's and women's collections with top designers from across the world. (The restaurant, Boston Public, abruptly closed this week because of financial problems, according to chef Pino Maffeo.) Louis has served as one of the city's top fashion forces, producing designers such as Boston native Joseph Abboud and helping make Newbury a shopping destination. The Back Bay boutique pushed the boundaries of the city's conservative tastes, offering luxury goods such as $2,500 Balenciaga women's leather bomber jackets and a $25,000 one-of-a-kind Tuleh black, beaded coat. The high-fashion, high-priced Louis Boston, known as the place for custom-made suits, earned a reputation over the years as bringing in the hot brands before other retailers and staying ahead of the trends. The store's stately 1863 building, home to the New England Museum of Natural History until the late 1940s, is prime real estate, located on manicured grounds at the corner of Berkeley Street. With its own parking in the middle of the bustling retail district, the freestanding Louis Boston space could fetch some of the city's highest rents at $200 per square foot on the floor level, according to real estate brokers. Andy LaGrega, of the Wilder Cos., a Boston development firm, described the Louis Boston building, designed by noted architect and Bostonian William G. Preston, as, "The most iconic individual retail location in the Back Bay." One high-end designer negotiated for the building about six months ago, but the deal ultimately fell through, brokers said. Retail analysts expect an upscale brand, such as Ralph Lauren or Gucci, to replace Louis Boston in the space, but they also pointed out that the Natick Collection's recent expansion of a luxury wing in the suburban mall could lessen demand for more designer stores in the region. "It's an awesome piece of real estate that could command the attention of any world-class retailer," said Geoff Millerd, a senior director at real estate company Cushman & Wakefield of Massachusetts Inc.
Over the last two years, national merchants with deeper pockets such as Guess, Filene's Basement, Victoria's Secret, and H&M moved into a building near Louis Boston, pushing up rents all along Newbury Street, and squeezing out smaller independent stores. Greenberg said high rents weren't a factor in her decision to leave the neighborhood, but rather the quality of tenants. "There is a changing character from the funky shops to something more generic. 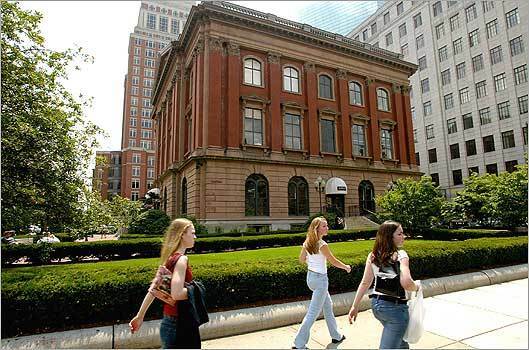 And we regret that," said Susan Ashbrook, vice president of the Neighborhood Association of the Back Bay. "The Louis Boston is an incredibly historic building and the neighborhood association is very keen to see that it will be preserved properly by whoever comes into the space."